Historic downtown home gets an elegant update. 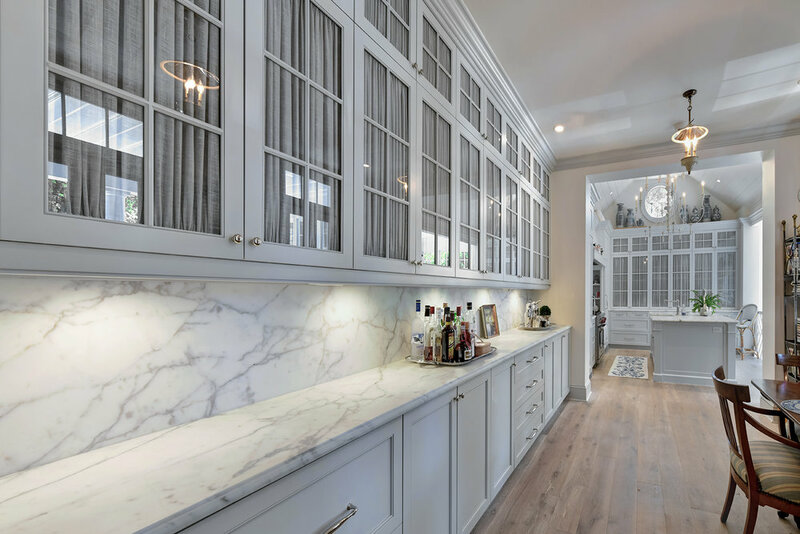 Cool tones and custom appliance fronts create a seamless look while the curtained glass front cabinets provide ample space and tie the kitchen and dining room together with a refined grace. A smaller room doesn’t feel tiny with a monochromatic color scheme and mirrored doors that reflect natural light and create the illusion of space. Making the most of available space in downtown living. Everything has its place in this upgraded kitchen with ample storage space. Cooper-hued hardware adds a warm touch to the clean white cabinetry. Floating shelves in rich walnut add depth and interest to an interior wall. Adding a bench and cabinetry to a central area helps corral items for the comings and goings of a busy family. Built-in custom cabinets and shelves make the most of a small area adjacent to the fireplace. Stream-lined hardware on custom cabinetry creates a smooth look throughout the kitchen. Photography by Ellis Creek Photography. Sleek kitchen cabinetry makes the most of available wall space while offering fully functional storage space. Photography by Ellis Creek Photography. A light-filled narrow bathroom becomes beautiful and functional with the addition of custom drawers and countertops. Photography by Ellis Creek Photography. Built-in cabinets create a partition but allow light to flow making for a spacious interior feeling. 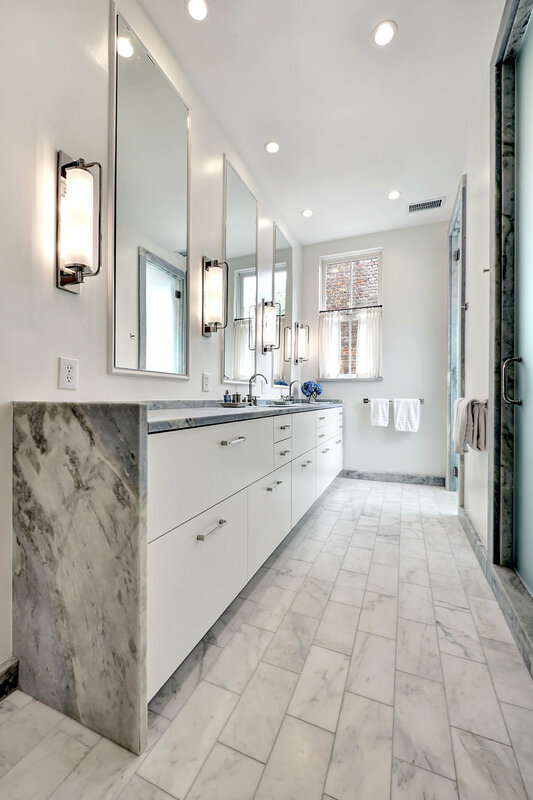 Gray and white marble mixed with smooth white cabinetry creates a classic, timeless look. Individual style in a classic lowcountry home. A unique custom bar reflects the individual style of the owners and anchors the room with a beautifully grained walnut wood. Evan’s craftsmanship undoubtedly took our home renovations to the next level. Adding built-ins to a mid-19th century home with nary a right angle in sight was a challenge that Evan eagerly accepted. He built a stunning wet bar for our great room, a full wall of bookcases in a room with a dramatically sloping floor (no small feat! ), built-in cabinetry for clothing and storage tucked into the eaves of the master bedroom, additional cabinets for toy storage in the playroom and an impeccably-designed laundry area — oh, and a gorgeous wooden bench for our hallway. Beyond his exquisite craftsmanship, Evan is also incredibly personable and immaculate — he arrived with not just a shop-vac but a Swiffer as well and tidied up daily before leaving the job site! We would absolutely hire Evan again and have been happy to recommend him to friends and neighbors. A mirrored back panel reflects the warm wood tones. A sleek built-in dresser and armoire create abundant storage by utilizing dead space in the knee wall. Floor-to-ceiling built-in shelves create a library wall, every book lovers dream.